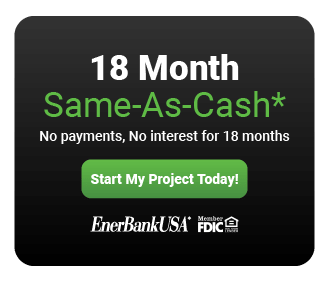 8 Months Same as Cash Loans provided by EnerBank USA, Member FDIC, (1245 Brickyard Rd., Suite 600, Salt Lake City, UT 84106) on approved credit, for a limited time. *Repayment terms vary from 30 to 138 months. Interest waived if repaid in 18 months. 17.58% fixed APR, effective as of [03/01/18], subject to change. Interest starts accruing when the loan closes. 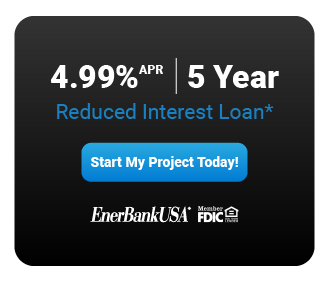 4.99% 5 Year Term Loans provided by EnerBank USA, Member FDIC, (1245 Brickyard Rd., Suite 600, Salt Lake City, UT 84106) on approved credit, for a limited time. *Repayment term is 60 months. 4.99% fixed APR, effective as of [03/01/18]. Minimum loan amounts apply. The first monthly payment will be due 30 days after the loan closes. 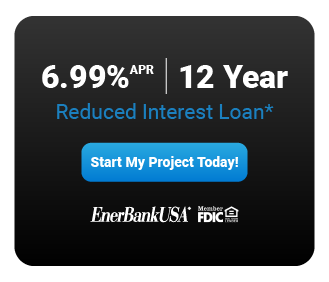 6.99% 12 Year Term Loans provided by EnerBank USA, Member FDIC, (1245 Brickyard Rd., Suite 600, Salt Lake City, UT 84106) on approved credit, for a limited time. *Repayment term is 144 months. 6.99% fixed APR, effective as of [03/01/18]. Minimum loan amounts apply. The first monthly payment will be due 30 days after the loan closes. It’s a convenient way to pay for your purchases. Our financing plans feature these exclusive benefits. Click to choose your financing option above. Use our new payment calculator! 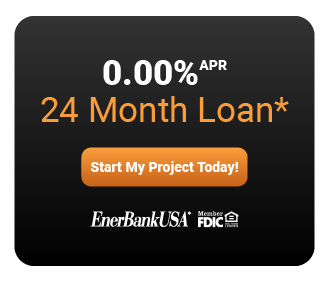 For use in determining a borrower's estimated monthly payment with all monthly payment loan options - not intended for use with Same-As-Cash loans.